Elysium Cognitive SIEM™ delivers the latest and most flexible security system to reduce cost and complexity while providing unmatched scalability and integration. Modern threats evolve rapidly and are increasing in frequency and malevolence. Detection delays can represent millions in damage, jeopardize corporate brands, and put security jobs in jeopardy. Are you well positioned to adapt to these new-age threats? Relying on threat data that is stale or inaccurate is a recipe for failure. 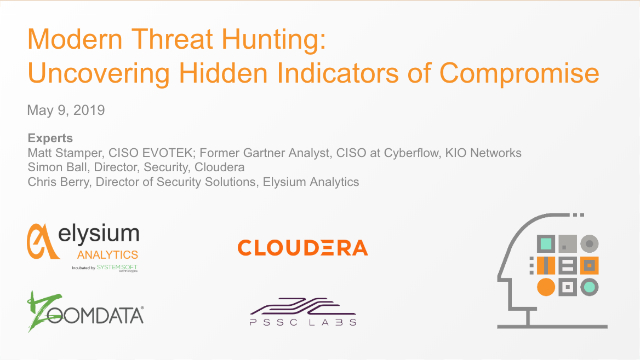 This webinar will bring you up to date on how threats are changing and new, proven methods for identifying and countering them early. Workflows and application use will be used to present critical path methods for threat hunting and preemptive breach discovery. Reduce your risk by knowing how threats are evolving and the best methods for countering them.